For other uses, see Bokeh (disambiguation). An example of a portrait photo (of Katherine Maher). Note the 'swirly' bokeh. 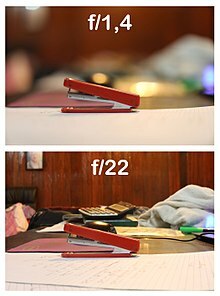 How the bokeh varies with the aperture. In photography, bokeh (/ˈboʊkeɪ/ BOH-kay; Japanese: [boke]) is the aesthetic quality of the blur produced in the out-of-focus parts of an image produced by a lens. Bokeh has been defined as "the way the lens renders out-of-focus points of light". Differences in lens aberrations and aperture shape cause some lens designs to blur the image in a way that is pleasing to the eye, while others produce blurring that is unpleasant or distracting ("good" and "bad" bokeh, respectively). Bokeh occurs for parts of the scene that lie outside the depth of field. Photographers sometimes deliberately use a shallow focus technique to create images with prominent out-of-focus regions. The term comes from the Japanese word boke (暈け or ボケ), which means "blur" or "haze", or boke-aji (ボケ味), the "blur quality". The Japanese term boke is also used in the sense of a mental haze or senility. The term bokashi (暈かし) is related, meaning intentional blurring or gradation. The English spelling bokeh was popularized in 1997 in Photo Techniques magazine, when Mike Johnston, the editor at the time, commissioned three papers on the topic for the May/June 1997 issue; he altered the spelling to suggest the correct pronunciation to English speakers, saying "it is properly pronounced with bo as in bone and ke as in Kenneth, with equal stress on either syllable". The spellings bokeh and boke have both been in use since at least 1996, when Merklinger had suggested "or Bokeh if you prefer." The term bokeh has appeared in photography books as early as 1998. It is sometimes pronounced /ˈboʊkə/ (boke-uh). 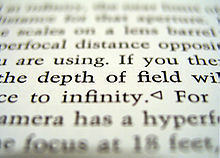 The depth of field is the region where the size of the circle of confusion is less than the resolution of the human eye. Though difficult to quantify, some lenses have subjectively more pleasing out-of-focus areas. "Good" bokeh is especially important for macro lenses and long telephoto lenses, because they are typically used in situations that produce shallow depth of field. Good bokeh is also important for medium telephoto lenses (typically 85–150 mm on 35 mm format). When used in portrait photography (for their "natural" perspective), the photographer usually wants a shallow depth of field, so that the subject stands out sharply against a blurred background. Bokeh characteristics may be quantified by examining the image's circle of confusion. In out-of-focus areas, each point of light becomes an image of the aperture, generally a more or less round disc. Depending on how a lens is corrected for spherical aberration, the disc may be uniformly illuminated, brighter near the edge, or brighter near the center. A well-known lens that exhibited the latter "soap-bubble" characteristic was that produced by Hugo Meyer & Co., more recently revived by Meyer Optik Görlitz. Lenses with 11, 12, or 15 blade iris diaphragms are often claimed to excel in bokeh quality. Because of this, the lenses do not need to reach wide apertures to get better circles (instead of polygons). In the past, wide aperture lenses (f/2, f/2.8) were very expensive, due to the complex mathematical design and manufacturing know-how required, at a time when all computations and glass making were done by hand. Leica could reach a good bokeh at f/4.5. Today it is much easier to make an f/1.8 lens, and a 9-bladed lens at f/1.8 is enough for an 85mm lens to achieve great bokeh. Some lens manufacturers including Nikon, Minolta, and Sony make lenses designed with specific controls to change the rendering of the out-of-focus areas. The Nikon 105 mm DC-Nikkor and 135 mm DC-Nikkor lenses (DC stands for "Defocus Control") have a control ring that permits the overcorrection or undercorrection of spherical aberration to change the bokeh in front of and behind the focal plane. The Minolta/Sony STF 135mm f/2.8 [T4.5] (with STF standing for smooth trans focus) is a lens specifically designed to produce pleasing bokeh. It is possible to choose between two diaphragms: one with 9 and another with 10 blades. An apodization filter is used to soften the aperture edges which results in a smooth defocused area with gradually fading circles. Those qualities made it the only lens of this kind on the market from its introduction in 1999 to 2014. In 2014 Fujifilm announced a lens utilizing a similar apodization filter in the Fujinon XF 56mm F1.2 R APD lens. Sony added the Sony FE 100mm F2.8 STF GM OSS in 2017. In 2015, Meyer Optik USA Inc. launched a Kickstarter campaign to produce the Trioplan f2.9/50, a new lens based on one originally produced by Hugo Meyer & Co.; both lenses exhibit a characteristic "soap-bubble" bokeh. In 2016, Apple Inc. released the iPhone 7 Plus which can take pictures with "Portrait Mode" (a bokeh like effect). Samsung's Galaxy Note 8 has a similar effect available. Both of these phones use dual cameras to detect edges and create a "depth map" of the image, which the phone uses to blur the out-of-focus portions of the photo. Other phones, like the Google Pixel, only use a single camera and machine learning to create the depth map. In 2017, Vivo released a smartphone with dual front lenses for selfies with bokeh. The first, a 20 MP lens, uses a 1/2.78" sensor with f/2.0 aperture, while the second, an 8 MP f/2.0 lens, captures depth information. Bokeh can be made with a combination of both lenses, and shots can be refocused even after they are captured, adding bokeh effects with different depths. In early 2018, the Honor 9 Lite smartphone was released with quad cameras (two dual-lens). Both the front and back cameras have a 13MP main lens and a 2MP lens for capturing bokeh depth information. An extremely shallow depth of field, a common effect in macrophotography, emphasizes bokeh. 200 mm lens at f/2. The bokeh produced by a catadioptric lens (also called a mirror lens). An example of the bokeh produced by the Canon 85 mm prime f/1.8 lens. The polygonal shapes are due to the 8-bladed aperture diaphragm being slightly closed. At its full aperture (f/1.8) these shapes would be smooth and not polygonal. Catadioptric lens bokeh seen in more detail. An example of the creative application of bokeh. An example of the bokeh produced by the Canon 18–55mm f/3.5-5.6 IS II lens. A bokeh created with Nikon D3300 Camera 18-55mm f/3.4-5.6 G VR II Lens. Bokeh can be simulated by convolving the image with a kernel that corresponds to the image of an out-of-focus point source taken with a real camera. Unlike conventional convolution, this convolution has a kernel that depends on the distance of each image point and – at least in principle – has to include image points that are occluded by objects in the foreground. Also, bokeh is not just any blur. To a first approximation, defocus blur is convolution by a uniform disk, a more computationally intensive operation than the "standard" Gaussian blur; the former produces sharp circles around highlights whereas the latter is a much softer effect. Diffraction may alter the effective shape of the blur. Some graphics editors have a filter to do this, usually called "Lens Blur." Some advanced digital cameras have bokeh features which take several images with different apertures and focuses and then manually compose them afterward to one image. More advanced systems of bokeh use a hardware system of 2 sensors, one sensor to take photo as usual while other ones record depth information. Bokeh effect and refocusing can then be applied to an image after the photo is taken. In 2009, a research group at MIT Media Lab showed that the bokeh effect can be used to make imperceptibly small barcodes, or bokodes. By using barcodes as small as 3 mm with a small lens over them, if the barcode is viewed out of focus through an ordinary camera focused at infinity, the resulting image is large enough to scan the information in the barcode. ^ a b Gerry Kopelow (1998). How to photograph buildings and interiors (2nd ed.). Princeton Architectural Press. pp. 118–119. ISBN 978-1-56898-097-3. ^ Roger Hicks and Christopher Nisperos (2000). Hollywood Portraits: Classic Shots and How to Take Them. Amphoto Books. p. 132. ISBN 978-0-8174-4020-6. ^ Tom Ang (2002). Dictionary of Photography and Digital Imaging: The Essential Reference for the Modern Photographer. Watson–Guptill. ISBN 0-8174-3789-4. ^ a b Harold Davis (2008). Practical Artistry: Light & Exposure for Digital Photographers. O'Reilly Media. p. 62. ISBN 978-0-596-52988-8. ^ John W. Traphagan (2000). Taming oblivion: aging bodies and the fear of senility in Japan. SUNY Press. p. 134. ISBN 978-0-7914-4499-3. ^ Johnston, Mike (April 4, 2004). "The Sunday Morning Photographer, 2004: Bokeh in Pictures". luminous-landscape.com. Retrieved July 3, 2009. ^ Merklinger, Harold. "Understanding Boke". luminous-landscape.com. Retrieved July 3, 2009. ^ Wes McDermott (2009). Real World Modo: The Authorized Guide: In the Trenches with Modo. Focal Press. p. 198. ISBN 978-0-240-81199-4. ^ Blog. "How to Create Soap Bubble Bokeh". ^ Todd Vorenkamp. "Understanding Bokeh". ^ Karsten Stroemvig. "DIY — Create your own Bokeh". ^ "AF DC-Nikkor 135mm f/2D Single Focal Length FX Auto Focus Lenses NIKKOR Lenses". europe-nikon.com. Retrieved 2015-05-01. ^ "AF DC-NIKKOR 105mm f/2D from Nikon". ^ "AF DC-NIKKOR 135mm f/2D from Nikon". ^ "Fujifilm introduces XF 56mm F1.2 R APD with apodization filter". DPReview. ^ "Neu von Sony: E-Mount-Objektive 100 mm F2.8 STF GM, FE 85 mm F1.8; Blitz HVL-F45RM". Photoscala (in German). 2017-02-07. Archived from the original on 2017-02-11. Retrieved 2017-02-10. ^ Markus Keinath. "Cheap DC Nikkor Substitute". ^ Meyer-Optik-Görlitz / net SE. "Meyer Optik brings back legendary Trioplan f2.8/100 'soap bubble' bokeh lens with Kickstarter campaign". Archived from the original on 2016-08-18. Retrieved 2016-08-03. ^ "Apple Just Released Their Fake Bokeh Portrait Mode to Everyone". PetaPixel. 2016-10-24. Retrieved 2017-11-28. ^ Simpson, Jayphen (11 December 2017). "How Portrait Mode Works and How It Compares to an $8,000 Camera". PetaPixel. Retrieved 11 December 2017. ^ "vivo V5 Plus becomes official with dual front camera, Snapdragon 625". January 18, 2017. ^ Adobe Photoshop CS3 Livedocs. "Add lens blur". Archived from the original on 2014-05-23. Retrieved 2014-05-23. ^ Giles, Jim. "Next-generation cameras bring photography tricks to the masses". New Scientist (Subscription required). Retrieved 2011-04-04. ^ Ankit Mohan and Douglas Lanman and Shinsaku Hiura and Ramesh Raskar. "Image Destabilization: Programmable Defocus using Lens and Sensor Motion". Archived from the original on 2009-09-24. ^ Lars Rehm (March 25, 2014). "HTC launches One M8 with new 'Duo Camera'". ^ Fildes, Jonathan (2009-07-27). "Technology | Barcode replacement shown off". BBC News. Retrieved 2012-02-19. ^ Mohan, A., Woo, G, Hiura, S, Smithwick, Q, Raskar, R. Bokode: Imperceptible Visual Tags for Camera Based Interaction from a Distance Archived July 30, 2009, at the Wayback Machine. ACM SIGGRAPH 2009. Wikimedia Commons has media related to Bokeh. Look up bokeh in Wiktionary, the free dictionary.